Authority Hacker Pro Review - Can You Make Money Online With It? Is the Authority Hacker course just another scam in a sea of fake gurus with rubbish information products, memberships and programs that all "guarantee" your success making money online? "Are there any 'how to make money online' courses that actually work?" Countless hours of reading through forum threads and watching YouTube videos filled with misinformation or pitch-fests disguise as 'content' to try and find helpful people who knew what they were talking about. Today? You don't have to go through all that wasted time and frustrating effort! There's no need to worry if you're going in the "wrong direction" when you are building your business online because there is a team who has put together a series of blueprints, trainings and templates that show you exactly how to lay the foundation for a truly successful business online. Indeed, I'm talking about the Authority Hacker Pro program! In this review, I will be showing you inside of the Authority Hacker Pro system as well as sharing the results that I've had and other students of theirs have had, to help you understand if the Authority Hacker Pro program is for you. The first question that most people have is: "is this program for advanced Internet marketers only?" With "Pro" in the name, it sure seems as if it is. And, as someone with over 15 years of Internet marketing experience, I still receive great value from their training. But it is definitely not a professional only program as they have specifically created and included a starter course called "The Authority Site System"
If you sign up for Authority Hacker Pro, you also receive their Authority Site System Free which is a $997 value when sold on it's own. I will explain to you how I use the full AuthorityHacker Pro program as a seasoned Internet marketing veteran here soon… But first, let's dig into The Authority Site System program because you need a stable foundation to build upon. The Authority Site System (TASS) that is a part of Authority Hacker Pro contains three main components designed to help you lay a stable foundation for your authority site and for your online business. TASS Component #1 - The main training modules. This part of the Authority Hacker program is designed to help absolute beginners get up to speed with Internet marketing fast. 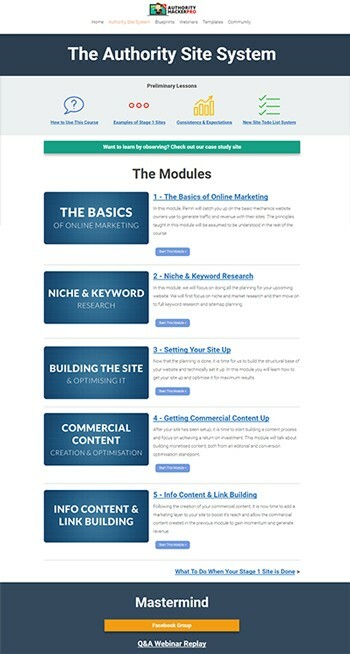 They start with an overview of the business model, they cover the basics of online marketing and move into niche and keyword research second. The third training is all about building your site and optimizing it, followed by the commercial content creation and optimization training. Finally, they wrap up with marketing content and link building training. Every single component is designed to help you quickly get the result you need from each of the lessons or modules so you can move forward building your business, fast. This helps you to make progress fast, because speed of implementation is key for growing a successful business online. Being an Internet entrepreneur and starting an online business can feel like a lonely endeavor. Spending late nights, weekends, early mornings sitting on your laptop working away creating content can be a lonely experience… And sometimes it takes an outside opinion or perspective to help us quickly get through roadblocks on to the next step. You can connect with new friends, accountability partners, and get your questions answered fast in this Facebook group. Sometimes it helps to see a quality example of what you're creating, to help you focus your efforts and energy towards a specific goal. Most Internet marketers are scared to share their niche and to share their money sites… Not these guys! They are more focused on helping you have high quality, professional examples for you to model. This is why they share several high-quality niche authority sites that they have built, their students have built, and others have built… As examples and guiding lights for you to follow as you're creating your niche authority site. After joining, you get access to look into even more of their best-performing sites so you can model your approach on what is proving to work for them! You can opt-in for their lead magnets, reverse-engineer their funnels, analyze their content marketing, even find out where they are getting their best backlinks from with the training you will learn in the Pro course! You need real-world examples and guiding lights for you to follow as you're creating your niche authority site... And they offer you just that! Authority Hacker Pro Review - Your Path To Becoming A Professional Internet Marketer. Whether you already had the foundation of an authority site, or you follow the steps in The Authority Site System, the bulk of their training is inside of the Authority Hacker Pro program. Authority Hacker Pro is broken up into four main components which you will learn more about, next. The pro blueprints inside of Authority Hacker are truly some of the most valuable Internet marketing training I've ever seen. They are organized, detailed, and most important: Instantly Actionable! Within each category, there are often subtopics to help you understand all of the bits and pieces involved in a certain marketing discipline. Within each sub-topic, there are even more lessons to make sure you get all the info you need in simple, bite-sized chunks! For the sake of brevity, I won't detail every single one, but let's unpack the content marketing and SEO category a little deeper so you can understand more of what is included and how the member's area is laid out. In this category, they have five separate blueprints available as you can see from the screenshot to the right. Within each of these blueprints, there are many lessons that build upon each other to give you a professional level education on each specific topic. Going deeper into the Produce & Outsource Top Content Blueprint, there are a number of specific lessons that will help you understand every aspect of content creation and outsourcing that job to writers. This is great because it helps you get started now if all you have is energy to put in, so you can focus your energy like a laser to achieve quick results in your business. If you are busy and have a budget to work with, or if you are looking to scale your content marketing… The training expands into how you are able to outsource the content creation process to get more leverage on your side for your content marketing efforts. 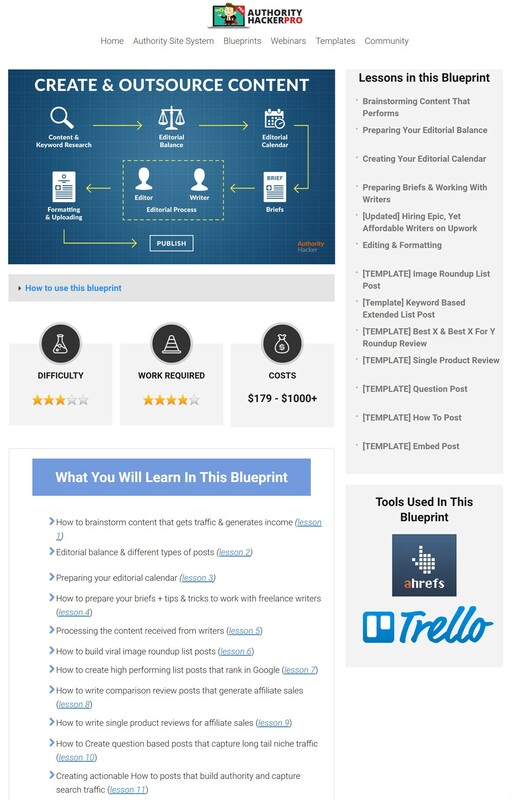 The below screenshot is from inside Authority Hacker Pro, looking at the lessons found under the Create & Outsource Content Blueprint. As you can see above, this is a clean and efficient layout designed to help you get the specific information you need FAST so you can be in and out and get back to publishing content! You are not required to watch every lesson in order, you are free to go straight to the item that is most useful for you at this exact moment so you can get in, get trained and get back to growing your authority site! That is a lot of useful and actionable training plus some powerful templates to get you up to speed and taking action, immediately... Plus with these different post template types, you will never run out of content ideas that you can publish fast with great results. You see, at this phase in my business, my goal is to hire and train quality teammates to help me accomplish many of my marketing goals and activities, with minimal input from myself. I am super busy, focused on delivering as much great content as I can through YouTube and my email list and I don't have time to manage my blog effectively. Last month I decided to hire a new writer and instead of spending a week or two training them myself, I simply gave them access to the specific blueprints inside of Authority Hacker Pro and allowed them to train themselves, so they can get up to speed on what SEO optimized content looks like. Additionally, they have learned how to do keyword research, how to research for topics on competitor websites, and much much more! This not only saved me time which is incredibly valuable to me, but it is helping me get a better result from my new teammate then had I simply tried to train them on my own. Every one of their blueprints is laid out in this same manner… And to be perfectly honest, this is by far the most comprehensive Internet marketing training available when it comes to building profitable authority sites fast. In total there are over 220 training videos that are full of value and literally hold you by the hand and teach you everything from the basics to the most advanced tactics in easy to follow video trainings! As of this writing, they have nearly 30 prerecorded webinars available, answering specific questions about the different blueprints and lessons. The webinars are an opportunity for them to go deeper and answer your specific questions on important topics regarding your success in Internet marketing. All of their webinars are performed live for members only and in case you are unable to attend live, they record and upload them to the member's area for easy consumption when the timing is good for you! They announced their webinars early and always have an area for you to submit your questions regarding the monthly webinar topic… So they can answer your specific questions! Having this ongoing access to these experts who run Authority Hacker Pro and being able to ask specific questions is an absolute blessing for you in growing your business. "That's all great theory, but how do I actually implement what you just taught me?" This is where the Authority Hacker Pro templates come in and absolutely destroy every other "how to make money online" Internet Marketing training course out there. This is the Internet-equivalent of getting your competitors playbook before the big game! With nearly 30 separate templates, each is linked to from the lesson in which it's covered… But they have a special template library that gives you access to all of the templates in one place, too. Remember, these are more than just training on a topic… These are actual templates that you can download modify and publish! These will save you an incredible amount of time while also assuring you that you get a high quality finished product in the shortest amount of time possible. 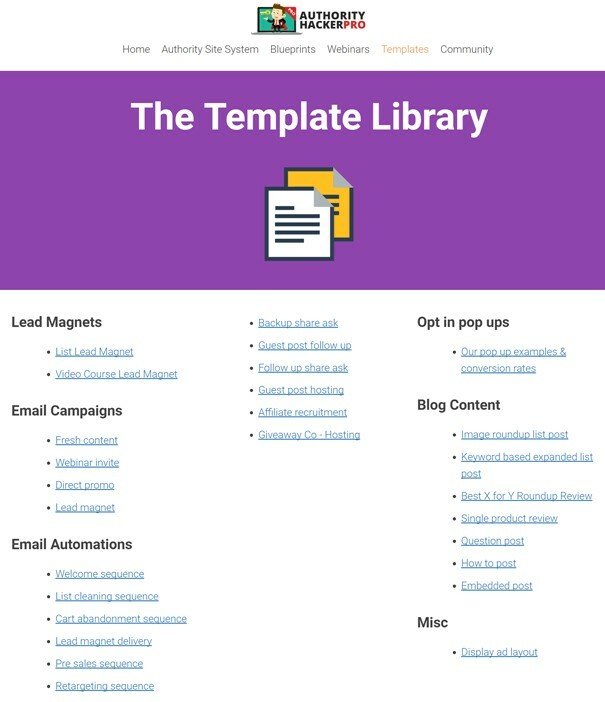 For example, their lead magnets templates include two separate templates. #1 - List lead magnet and #2 - Video course lead magnet. These lead you to specific training and downloads that are "fill in the blank" easy. In this particular example, the template is a pre-made PowerPoint slide deck with all of the information and instructions for you to create a powerful lead magnet. They don't just "tell you" what to do… They literally give you PowerPoint slide deck and video training that will help you get your lead magnet up and running, fast. It's important to remember that you become like those who you surround yourself with… For us Internet entrepreneurs, sometimes that can be challenging! Most of us live in a "9-to-5 day job" kind of world where we are the "weirdos" building financial freedom online. AuthorityHacker offers you access to a private Facebook group for their Pro members only (In addition to the TASS group from above) where you are able to surround yourself with some of the highest caliber content marketers and Internet marketers anywhere. This is a small and close-knit community of people who are actively growing their Internet businesses by creating and publishing content and being of value to an audience. You can get help with questions you might have, or you can get inspiration from others who are crushing it! You are able to make new friends with people who can become joint venture partners or even accountability partners. If you are ever feeling stuck, or down about things… This is a great resource for you to tap into the collective community that all want to see you succeed with your Internet business! Whether you are new to a game or a season Pro, this is one of the most valuable groups on Facebook! It is a safe place, free of pitches and promotions… Where action takers and implementers connect to share stories of what's working for them. The Authority Hacker Pro Creators - Can You Trust Them? Knowing who to trust in the world of Internet marketing education is paramount to your success. There are more "fake gurus" using sleazy persuasion tactics mixed with overstated claims and rented Lamborghinis in an attempt to get your money. On the other side of the coin, you have true experts who are quietly grinding away building their businesses while teaching on the side. These true industry experts who you can actually trust, are less noticeable and often harder to find. One big thing to watch out for our "teachers" who have no other business than teaching how to make money online… Knowing that your teachers are active in the business models they are teaching proves they trust in their own content and approach and increases the likelihood that they can help you make money with that method as well. To help you learn more about the authority had her Pro creators I interviewed Mark Webster, one of the authority hacker cofounders to learn more about his story and how he met his co-founder and to learn about their path to creating AuthorityHacker. Honestly, if you've read this far… You can probably tell that I'm a raving fan of the Authority Hacker program! When I first got started making money online, had I found a course like this… It would have shaved years off of my learning curve and gotten me to a million dollar business much faster. To this day, I personally find myself logging into this program for new blueprints, webinars, and their templates when I want to expand my content marketing efforts. And as I stated earlier, anytime I hire a new marketing teammate… I plug them into the Authority Hacker training so they can get caught up to speed on the marketing best practices for content marketing online, fast. Honestly, there is only one thing missing from the Authority Hacker Pro course that stands between you and the financial freedom you deserve from an online business… That one thing is implementation! There is no way around the fact that you must put the time and energy in that is required to follow the training, create the content, build your site, and market your business. You must be willing to adapt and persevere at all costs after you join the program if you ultimately want to achieve true financial freedom. They have had more success stories from Authority Hacker Pro students than any other course I've ever participated in. Or Josh who turned a hobby into $1 million-plus business: Click here to watch an interview with Josh. Honestly, they are teaching the exact process (and more) that my wife and I have used to make over $1million online, ourselves. People often ask me "Miles, when are you going to create a course?" The truth? I don't have to because the Authority Hacker team has built the best internet marketing course to learn how to make money online that I've ever seen! The Authority Hacker Pro system is a must-have! They only enroll new students a couple of times per year, so if you visit their site and it's simply a waiting list… Sign up to get early notice when they open the program next. Getting going now saves you from having to try and piece it all together on your own... Taking two steps back for every step forward you take. You don't have to go through all that headache like I did. Click Here And Get Authority Hacker Pro, now! I look forward to connecting with you inside the AuthorityHacker Pro community! Hi, I want to learn about affiliate marketing and make money online. Will this program teach me how to do affiliate marketing? Also, I am not a computer pro and absolutely no idea. Please let me know if this program will help me. This course does teach exactly that... You have to be willing to dig in and put in the work, but they will guide your efforts towards a proven path to success, for sure! So if I️ were to buy the TASS will I️ have to buy the Pro version? Seems like the million dollar value is in the pro version than the site system. I’m guess what I’m really trying to say is could someone make a full time income with the TASS or have enough info to get your investment back so you could get their pro version if you have to buy it separately. TASS combined with the content in my channel is definitely enough... The 'missing ingredient' is 3 years of you working non-stop on one site to push your way to the top with it! That said, the Pro version has tons of insights that could help, but it is not necessary. You are saying with 36 mos of dedicated learning and hard work anyone can habe a profitabke business or system working for them? Depends on what you mean by 'hard work' to be honest... If you put in 40 hours per week producing great content, building a list and growing a relationship with those subscribers... Every week... For 3 years. All focused on 1 project, 1 plan (Like these guys layout in this course)... I'd be amazed if that didn't create success... But with that said, I'm sure someone could find a way to sabotage their own success. Most people jump from one idea to the next, to the next and never go deep enough on one project to create success. Success is not guaranteed for anyone but is available to those hungry enough to persevere and create it. Great Review and thank you for sharing. I have been bouncing back and forth between affilorama (blueprint or jetpack), Authority hacker and Anik Singals inbox blueprint. I see you are a big fan of AH and the program here, can you offer any insight to how it compares to the others? I am new and looking for a program to build a foundation on. 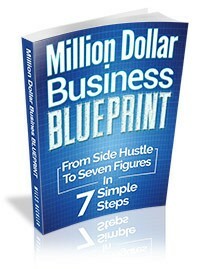 First off, cross Anik's Inbox Blueprint off your list... It is a waste of money and an example of a great sales letter and overproduced underwhelming product. I looked at Affilorama back in the day but don't like CB products... The Authority Hacker guys' stuff is REAL. That is the closest system/approach that my wife and I have used 3 separate times to create wildly successful niche sites. Their TASS "The Authority Site System" product is a great starting point... Check that webinar out! It is #3 here: https://www.milesbeckler.com/recommended-courses/ and if you are just starting, ignore all the others on this list! Hi Miles!great unbiased information as usual.I was looking into your recommended courses and my budget will allow for only one course,alas!Which one would you recommend if you had to choose only one.I've followed your videos on how to build my sales funnel and working on the FB ads as well.Thanks heaps!